Multi-beam lighting up to 450 lumens makes the ULTRA VARIO BELT rechargeable headlamp suited for the most demanding activities. 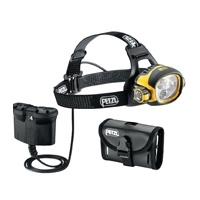 It is ideal when lighting needs and precision are crucial, as in caving or mountaineering. This headlamp has four lighting modes that allow the user to adapt the lighting to different situations: ambient lighting, proximity lighting, lighting for movement, or long-distance lighting. The high-capacity ACCU 4 ULTRA remote rechargeable battery allows the user to reduce the weight worn on the head while keeping the battery warm, for example under clothing, in order to optimize battery life in cold conditions. Ergonomics and construction make the ULTRA VARIO BELT headlamp particularly intuitive and reliable in any situation.